This super chunky yarn is easy for the beginning knitters who will see quick results with this substantial extra thick yarn.Make your own project and enjoy the process. I am sure you will enjoy to knit one of softest blanket. Different hands will produce different results. That's the joy of making something by hand. 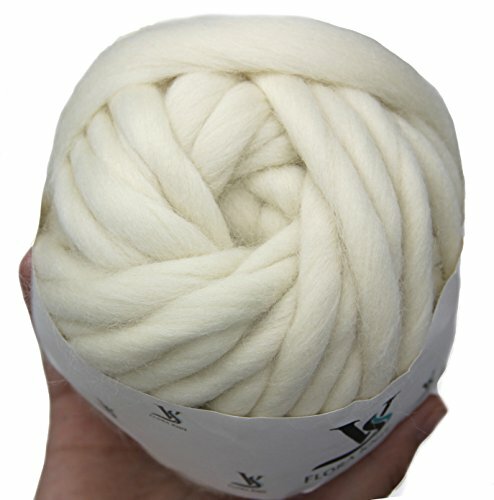 Merino Wool Yarn is yarn made from the fleece of the merino wool sheep. Merino's are prized for their incredibly soft coats, and in turn, produce the most amazing of fleeces, and even more amazing yarns for knitting. Upload your pictures when you finish a blanket or crafts to share your beautiful projects with others..
Fine fibers make Merino wool feel soft and luxuriously gentle next to your skin. Merino is hypoallergenic material. It will be your best friend. Your item should be taken to a professional dry cleaner to ensure the superior quality of your item is maintained upon cleaning. ✅STAPLE LENGTH:9-11cm Long Staple (the longer the better) with stronger fastness comparing 7-8cm length staple. ✅FREE TUTORIAL:Message Seller for Bulky electrical tutorial for beginers or students. If you have any questions about this product by FLORAVOGUE, contact us by completing and submitting the form below. If you are looking for a specif part number, please include it with your message.